This week's free game: "Q*bert"
Mon., Jan. 4, 2016, 6 a.m.
Q*bert (1982) was one of the first video games to mimic three-dimensional graphics with the use of an isometric camera and a vanishing point. The early days of gaming provided its fair share of potential universal mascots. Pac-Man, Mario, and even Pitfall Harry were in the running to represent the new medium in the early 1980s. Add to that list Gottlieb's Q*bert, who hopped around an isometric, Escher-inspired plane in his 1982 debut. You can play it below, thanks to the folks at Internet Archive! Click here to play Q*bert, free in your browser! The object of Q*bert is to change the color of all the cubes on the screen by touching them with the titular character. You'll lose lives (you start with three) by jumping off the cubes entirely or landing on the same space occupied by an enemy. Use the arrow keys to move Q*bert around the level. The lasting legacy of Gottlieb's game is the isometric view, which created the appearance of three-dimensional gameplay all the way back in 1982. It was used to great effect in RPGs that would follow, including the much-praised franchises Diablo, XCOM and Fallout. Jeff Lee is credited for the design of Q*bert, who never attained the status of universal video game mascot (that title arguably went to Shigeru Miyamoto's Super Mario). But the lovable fuzz ball did appear alongside Pac-Man in the 2015 film "Pixels," which I'm told is just plain awful. He also appeared in 2012's Wreck-It-Ralph, which I'm told is much better. If you've followed our free game posts for a while, you already know the fate of Gottlieb. The company, best known for its pinball machines, went belly-up in 1996. Q-Bert has seen several iterations through the years, with the most recent being 2014's Q*bert Rebooted. That game is not a gritty remake directed by Christopher Nolan, but rather a release for mobile devices and modern consoles that uses hexagonal platforms, increasing the number of possible jumps to six. 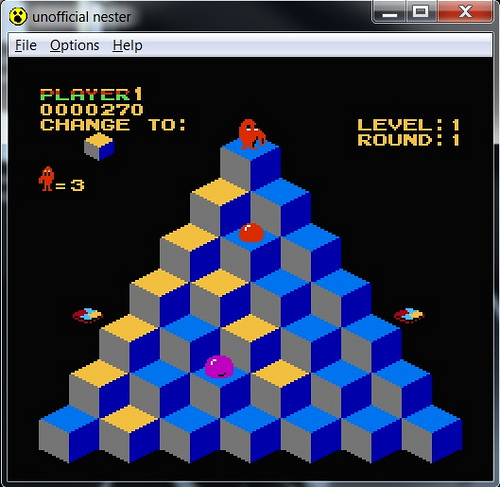 Did you feed quarters to the Q*bert machine in the 1980s? What's your favorite isometric game? Let us know in the comments below, and check back next week for another free video game.